This study brings together a substantial body of new evidence on the early years sector in Ireland. It comes at a time when the early years sector in Ireland, defined as the care and education of children aged 0-6, has experienced significant development in three main areas: introduction of the National Framework for Early Childhood Education (Síolta) and the Early Childhood Curriculum Framework (Aistear); introduction of the Free Pre-School Year for every child aged between three years two months and four years seven months; implementation of initiatives to improve quality and outcomes in the early years sector through the Prevention and Early Intervention Programme (PEIP), the National Early Years Access Initiative (NEYAI), and the formal Síolta Quality Improvement Programme. 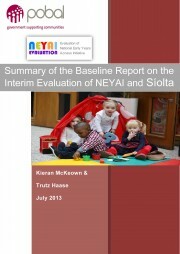 This document is a summary of the baseline report on the national evaluation of NEYAI and Síolta. Its purpose is to summarise the progress that has been made up to the mid-point in the evaluation and before the final report in 2014.